My son came home quite sun burned on his shoulders and neck, which resulted in this week�s subject: ALOE VERA � the indispensable first aid in your garden. With summer rapidly approaching, the season for sun burns are over us yet again. And despite generous application of sun screen it is easy to underestimate the strength of the sun, especially here in the south. I guess most of us have tried the burning pain followed by a day on the beach or by the pool, and in our family the Aloe Vera comes to our rescue every year. Like barbaric butchers we happily sacrifice the leaves of our Aloe Veras for the well-being of the family. Luckily, Aloe Vera multiplies with lots of little off springs so we have a constant supply. There are more than 250 species in the genus Aloe, but the most commonly known is the Aloe Barbadensis Miller, also called Aloe Vera, which is known for its healing and soothing properties. Because of their popularity, Aloe Vera plants are available at almost every garden centre. The medicinal properties of Aloe Vera have been known, and recorded since biblical times. It has been used for a variety of ailments, and as an ointment for burns, cuts, and rashes, as well as it is an ingredient in various beauty products. However, scientific evidence of Aloe Vera�s healing properties is contradictory, so I can only speak from personal experience. We have successfully used Aloe Vera to relieve pain and prevent blistering from sun burns and kitchen �accidents�, to relieve itching and pain from insect bites and rashes, and to heal cuts and smooth dry skin. It even turned out to be quite a success when my daughters had the chicken pox. You can also safely use Aloe Vera on your pets. For medicinal use, just cut of a lower leaf from the plant, slice it open and apply the gel on the affected area. Avoid the skin and any yellow substance � the gel should be clear and odourless. The gel is quite slimy and mucous-like, but quickly absorbed by the skin. The best leaves you get from mature plants between 2-5 years, after they have had flowers. If you do not use the whole leaf at once, you can keep it in the fridge for 1-2 days. Very importantly: Make sure you use an authentic Aloe Vera as some of the other Aloe species are poisonous and will have the adversary effect, causing a very bad rash. Aloe Vera is a semitropical succulent plant and as such, stores a large quantity of water within its leaves and root system. This makes it very resistant to lack of water, but also very sensitive to the cold, especially frost. Thus, back in the north, Aloe Vera is kept in pots indoors and allowed fresh air and true sunlight only in the summer. The climate here, however, is perfect for keeping your Aloe Vera outdoors all year round. When grown outdoors, Aloe Vera plants will produce tall stalks with green, white, yellow or orange flowers. The flower stalks should be removed when it is finished blooming. It is a very hardy perennial plant with almost no natural enemies, except the cold, overwatering and humans. 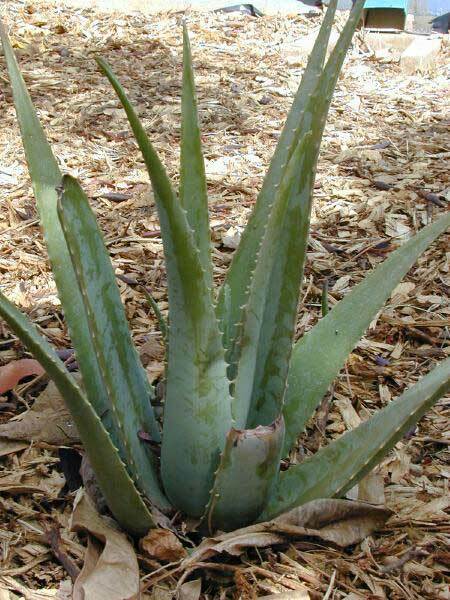 Aloe Vera is best planted in welldrained and sandy soil. Use a good commercial potting mix and mix it half/half with sand or gravel. Cover the plant with soil until where the leaves start. Place the Aloe in a warm and sunny spot and wait a few weeks before giving water, allowing the plant to heal the damages caused by the transplant. Aloes have a shallow, spreading root system, so if planted in a pot, choose a wide, rather than a deep one. During the winter months, the plant will become somewhat dormant, and watering should be kept to a minimum. Allow the soil to become completely dry before giving the plant a cup or two of water. During the summer months, give the plant a good soak, but then allow it to dry out before rewatering. Remember good drainage and feed Aloes with diluted fertilizer in spring. Pesticide is usually not necessary as it seldom has problems with pests or diseases. 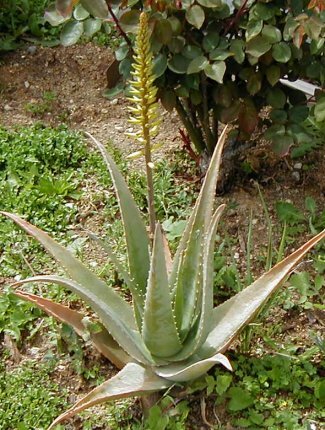 Although Aloes can be grown from seed, usually they are propagated by removing the offsets (which are produced around the base of mature plants) when they are a couple of inches tall. The easiest way to do this is to dig out the mother plant and then separate them carefully at the roots. It is important to remove the new plants as they will otherwise weaken the mature plant. The small plants are nice gifts for friends, family and neighbours, especially if given with information on its many qualities. If you have not planted your bulbs and corms already, it is still not too late. If you plant them now you will still be able to enjoy the beautiful flowers this summer. Now is also a good time for sowing grass, but remember to cover the seeds with netting or similar - or the birds will eat them. 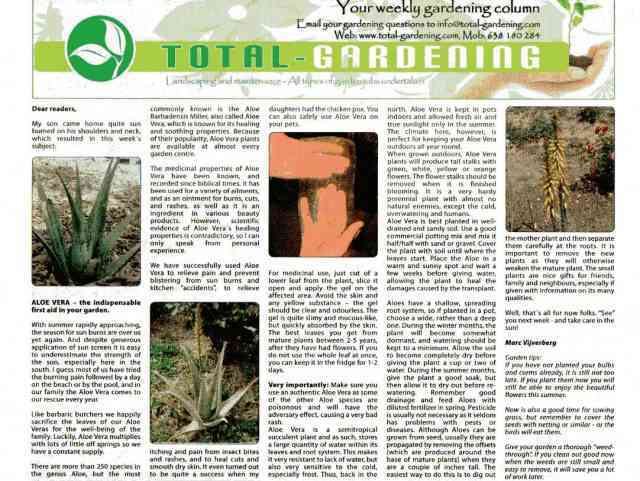 Give your garden a thorough �weedthrough�. If you clean out good now when the weeds are still small and easy to remove, it will save you a lot of work later. Well, that�s all for now folks. �See� you next week - and take care in the sun!